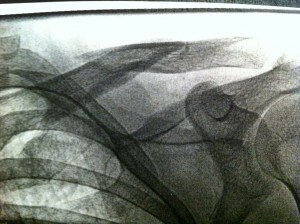 Broken collar bone and ear infections. A lesson in travel medicine. Recent events have helped me realize that I should keep a journal and share my travel adventures. On February 8th, I cras hed my bike while on my way home from work. It’s funny how fast things happen! Here I was bleeding, in pain on the dirty, sandy asphalt. My groceries spread all over the road, my bike on the ground several meters away. A few local people offering to help me in their broken English. I was on a small island in the Gulf of Thailand, the nearest hospital was about 2 hours by boat and I just had broken my collar bone, scapula and 2 ribs. I’m grateful that I have travel insurance (I use DAN) and a solid network of friends. This helped me get sorted and return back to Canada where I could get the support I needed to mend my wounds.. I spent the better part of the last month in bed or visiting various medical facilities. This inspired my desire to write about travel medicine and things to know when traveling/spending extended period of time in the tropics. At 39, I’ve had a few careers. I spent the early part of my 20s as an activist while studying nursing. After getting lost while scuba diving in the caribbean for nearly a year, I return to Canada and began to study business management and new media. I spent the better part of the past decade working as an new media executive until 2010 when I return to my first passion, mixing digital media and scuba diving. As a Professional Scuba Diving and Emergency First Aid Instructor, I get to travel around planet ocean and meet people from all over the globe. Despite feeling invulnerable, I’ve had my share of accidents, injured myself and/or got sick a few occasions. I’m living the dream and I feel that I truly have the best job in the world. That said, living and working in the tropics can have its ups and downs. Anyone who has spent an extended period of time abroad or gotten sick while traveling understand the importance of buying good travel insurance coverage, owning a cell phone with pre-programed emergency and local contacts, and having a well stocked emergency kit and medicine cabinet. Studies indicate that the cardiovascular disease accounts for most deaths during travel (50-70%), while injury and accident follow (~25%). Infectious disease accounts for about 2.8-4% of deaths during/from travel. Studies suggest that about half of the people from a developed country that stay one month in a developing country will get sick. Traveler’s diarrhea is the most common problem encountered. Ensuring that you are healthy should be one of your top priorities. It’s importance to visit a travel physician well before going away. Better understanding your health, abilities and limits is also crucial when planning your trip. The last thing you want is to have to take an emergency flight back home because you pushed your limit on a remote island or injured yourself while hiking a mountain in the wild. Q: How do I figure out what shots I should get? A: There are several possibilities. The Centers For Disease Control is a good resource for general information in the United States. The World Health Organization and several national organizations such as Health Canada are excellent resources. Local health departments sometimes provide information but, because of budgetary constraints, many cannot provide specific or up-to-date advice. One of the best resources is a travel medicine clinic (like the Healthy Traveler Clinic) which has very accurate, up-to-date information which is tailored to your itinerary and health history. Most can provide you with immunizations, medications, advice and just about anything you may want to know about a destination. Q: How do I find a travel medicine clinic? Q: How far ahead of my trip should I get my shots? A: Two months ahead is great as some immunizations take time to complete. But some shots, like Hepatitis A, are worthwhile right up to your departure date. Plan as far ahead as you can but check with the travel clinic before even a last-minute trip. Q: Do I need other things besides vaccinations? A: You may need Malaria prevention medication. There are also medicines available for effective treatment of traveler’s diarrhea, altitude sickness and more. The most important item is good, reliable, up-to-date travel health information. Keep your family’s vaccination records in a safe and accessible place and carry copies when you travel. If your destination country requires proof of yellow fever vaccination, you must carry the original International Certificate of Vaccination or Prophylaxis. Keep a copy of this certificate at home. If you are heading on a trip, take a moment to research the area you will be traveling to. There are various resources available to help perpare yourself for your holidays. Ask your doctor/pharmacist to help you prepare your personalized emergency and prescription kit. Most travel doctor and clinics can offer the following services. Keep your feet clean and remember the importance of wearing proper footwear. Wear your helmet and protective gear when riding motor bike. Drink water, 4-6 litres a day minimum, specially if diving or drinking alcohol. Sleeping is not a luxury, tired people have weaker immune systems. Maintain a well-balanced nutrition. Keep healthy snacks with you when on the road. Apply sunscreen before you go outside and reapply often. Use a mosquito repellent with DEET and a mosquito net on your bed. Don’t scratch or itch your skin, keep your wound clean, and dry. If hurt, change your bandage daily, use anti-bacterial cream and antibiotics. Cleanliness is godliness; maintain proper hygiene. If something happens while abroad. If you need urgent care while abroad, the best option is often the nearest hospital. In some countries, ambulances may not be common. Use whatever form of transportation you have to get to a hospital. Visit you in hospital and provide basic translation services if required. Assist in arranging for medical evacuation if treatment is not available locally. You must have appropriate travel health insurance to cover the costs, or pay the costs yourself. Help with travel health insurance issues. Contact your next of kin, with your authorization, if you have an accident or are hospitalized, or in the event of your death. Provide advice about burying a foreigner abroad or repatriating the remains to home country. Assist you in obtaining financial help from family and friends. Make alternative travel arrangements for you, including obtaining visas and other travel documents. As for me, short of a bruised ego, a few broken bones and a fairly uncomfortable return flight to Canada, I was lucky to walk away from This accident: I had no helmet, I was wearing flip flops, a pair of shorts and a T-shirt. In the end my accident will have cost me a few months of revenue, and many great dives, but nothing I can’t make up in time. I hope this shared experience will give you the foundation you need to prepare your next adventure. Remember that no mater how well you’re prepared, accidents do happen. Always have your emergency contact information, your travel insurance information and copies of your identity cards and passport with you. Best of luck and enjoy the journey. My next entry will be on Scuba Diving Medicine.